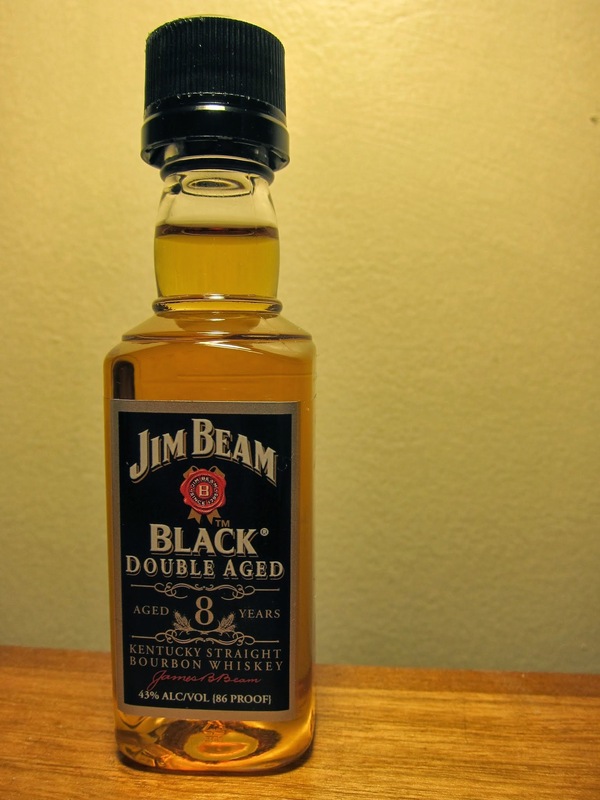 Jim Beam Black (43.0%): I never quite understood why Jim Beam never makes a big deal about the Black. I admit that I always had a soft spot for Jim Beam Black but I really think that it's one of the best price/value bourbon deals around with its price tag in mid twenties. I don't know why Jim Beam spends all their their time, energy and money trying to promote Devil's Cut, Jacob's Ghost or any other new flavored expressions. I never saw a serious commercial or an ad campaign for Jim Beam Black (not with Mila, with Willem or with Leonardo...) which really baffles me. Odd... On the label of the bottle it says that the spirit is double aged which means that the whiskey in it is eight years old and twice older than their flagship bourbon Jim Beam White. I have a cute wee bottle of Jim Beam Black on my desk tonight for this review. Thank to Joe Howell for the sample. Color: Polished copper, dark amber: Clear and shiny. Nose: Scrapings of a few vanilla beans, creme brulee and sweet corn muffin. Charcoal dying down under the grill soaked with all the barbecue fat and sauces after a long night. Butterscotch, star anise, candied orange peel and rose wood shavings. Adding a few drops of water brings pine needles, rosemary and spruce cones. Palate: Very sweet. Warm corn bread with salted butter melting on. Sweet rye cookies and sticky toffee pudding. Creme caramel, coriander, orange zest and toasted pine wood. A few drops of water did the same piny trick like it did at the nose: raw pine nuts and some pine forest honey. A nice early morning Spring hike in a North Eastern forest. Finish: Long enough to make an impression. Cinnamon, Christmas cake and campfire. Overall: Exactly how I remembered, a truly great bourbon... It gave me a nice Spring and/or Summer feel. Would go amazingly well with barbecue meat, on ice in a hot Summer afternoon with friends or to sip with a chocolaty dessert after dinner. This is the everyday bourbon you were looking for... By the way, I might be being a little skeptical but I have a weird feeling that it is getting harder and harder to find a bottle lately. I used to see it everywhere. Hmmm, maybe I should get a few bottles when I see them on the shelves just in case Jim Beam is getting second thoughts about its future... It is a serious competitor to Knob Creek after all and it is cheaper.